On December 17, 2014 Gov. Andrew Cuomo's administration announced they would permanently ban hydraulic fracturing in New York State. Cuomo cited the dangers fracking posed to air and water and public health. In 2010, the New York State legislature passed a temporary moratorium on fracking. In 2011, the New York State Department of Environmental Conservation (DEC) released a revised draft Supplemental Generic Environmental Impact Statement (SGEIS) to "addresses permit conditions required for gas drilling in Marcellus Shale and other areas of the State." The draft study recommends restricting fracking within New York City's watershed while opening up large parts of the rest of the state to drilling and fracking. Fracking could commence when the final DEC environmental impact study is issued, likely in 2012, if approved by NY Gov. Cuomo. In June 2012 the New York Times reported that, according to senior officials at the State Department of Environmental Conservation, Gov. Cuomo would likely limit drilling to the deepest areas of the Marcellus Shale rock formation — primarily Broome, Chemung, Chenango, Steuben and Tioga Counties. Drilling would be permitted only in towns that agree to it, and would be banned in Catskill Park, aquifers, and nationally designated historic districts. The strategy has not been made final and details could change, contingent on hydraulic fracturing receiving final approval from state regulators. The plan is part of a demonstration project in which the DEC would issue permits for a limited number of wells in certain areas and then monitor the fracking to see if the process could be done safely. Critics say drilling would primarily take place in economically distressed areas in need of the funds, raising issues of environmental justice. In 2012 the Medical Society of the State of New York called for a moratorium on natural gas extraction using hydraulic fracturing until scientific information on health impacts is available. After widespread opposition, NY state environmental officials said on Sep. 28, 2012 that they would restart the regulatory rule-making process, requiring them to repeat a number of formal steps, including holding a public hearing, likely pushing a decision until 2013. In February 2013 Environmental Conservation Commissioner Joseph Martens said the state would begin issuing fracking permits before creating regulations if the Health Department concludes that natural-gas drilling is safe. In June 2015 New York state officials banned fracking when the Department of Environmental Conservation issued the final document needed to ban fracking. However, the fracking ban could be rescinded, and both sides say lawsuits will likely be filed. In New York State over thirty bills were proposed in the 2010 legislative session to create various panels, commissions and task forces to investigate fracking and consider moratorium bills. Numerous bills on regulating hydrofracking were also been introduced. On August 3, 2010, the New York State Senate passed S8129B, by a vote of 48-9, which prohibited drilling permits from being issued by the state Department of Environmental Conservation (DEC) before an ongoing state environmental review of fracking had been finalized. The bill passed the Assembly by a vote of 93-43 on November 30, 2010. On December 13, 2010, NY Governor Paterson vetoed S8129B while issuing an Executive Order prohibiting hydraulic fracturing of horizontally drilled wells until July 1, 2011. Since that prohibition deadline has passed, Governor Andrew Cuomo is now considering fracking. While the moratorium bill was pending in the Assembly, DEC Commissioner Pete Grannis, New York’s top environmental official, was dismissed by Governor Paterson because of a memo reflecting the growing frustration of DEC officials with the understaffing and underfunding of their agency that was leaked to the press. The memo, a response to a request from the Governor’s budget division to cut 209 staffers from the DEC, described the agency as weak and in many ways ineffective: “The risks to human health … have already increased with respect to enforcement activities related to pollution sources,” wrote Grannis. In 2011, Governor Cuomo appointed Joseph Martens as the new Commissioner of the Department of Environmental Conservation. Martens has stated that he believes the State should wait until an EPA study on fracking was completed before making any decisions regarding drilling in the state. Then, on March 31, 2011, the natural gas company Norse Energy Corp issued a press release discussing their meeting with Commissioner Martens, shortly before Martens appeared on NPR’s the Capitol Pressroom stating his confidence in gas drilling starting soon. In February 2015 some upstate New York residents, that lived in job deprived areas, talked about seceding to Pennsylvania. Redrawing state lines would allow fracking to take place, say the supporters, which would be a boon for their communities they claim. 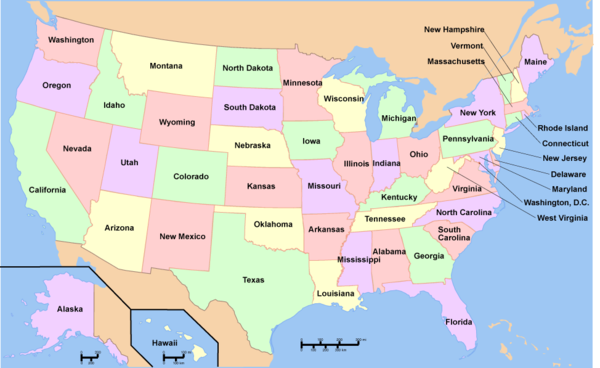 The odds of seceding are long. The Utica Shale lies beneath the Marcellus Shale. In October 2009, the Canadian company Gastem, which has been drilling gas wells into the Ordivician Utica Shale in Quebec, drilled the first of its three state-permitted Utica Shale wells in New York. The first well drilled was in Otsego County, New York. The 2011 Common Cause report, "Expenditures of the Natural Gas Industry in New York to Influence Public Policy: Parts 1 and 2," (2010 and 2011) found that "from 2001 through June 2011, the fracking industry gave $20.5 million to current members of Congress and spent $726 million on lobbying." For New York: "Natural gas industry lobbying expenditures total more than $2 million from the beginning of 2005 through the first 4 months of 2010, with the lion’s share spent in the past 2 years. Industry expenditures have increased more than six-fold since 2007, landing natural gas giant Chesapeake Energy among New York State’s top 50 lobbying spenders for 2009, the only energy company on the list." Gas companies lobbied for access to the Marcellus Shale and against the 2010 state moratorium on permits. Ten companies or trade groups that lobbied on fracking and other issues of concern to the natural gas industry spent $4.5 million lobbying in Albany from 2010 to 2012, according to an analysis prepared by the New York Public Interest Research Group. In 2009 Penn State geologist Terry Engelder calculated that there is a 50 percent chance the Marcellus Shale holds 489 trillion cubic feet (TcF) of technically recoverable natural gas, including 71.9 Tcf in New York. The odds that New York holds at least 30 Tcf are 90 percent, he wrote in the same 2009 report. In 2011, the U.S. Geological Survey (USGS) estimated that the entire five-state Marcellus formation held 84 Tcf, about one-sixth of Engelder’s estimate. In 2013 a four-person team of former gas executives and geologists calculated that, taking into account existing state and local restrictions on drilling, there is 4.2 Tcf of recoverable Marcellus gas in New York. Restrictions include setbacks from rivers, lakes, aquifers and buildings, as well as total bans in watersheds and some municipalities. To get at their estimate, they attributed the performance of Pennsylvania wells at a given thickness and depth to New York areas with comparable characteristics. The group said that Marcellus is less than 5,000 feet deep in most of New York’s border counties, making it shallower than the layer in Pennsylvania’s three lowest performing border counties. The EIA lists known dry natural gas reserves in the state at 253 billion cubic feet, as of 2013. Compression stations, also known as pumping stations, are facilities that help to transport natural gas through pipelines. They pose some health effects. A study published in a 2014 Reviews of Environmental Health found that spikes in air toxins around the Minisink, New York compressor coincided with residents’ adverse health symptoms. Toxins included volatile organic compounds (VOCs) as ethyl benzene, n-butane, n-hexane, as well as formaldehyde and particulate matter. Thirty five subjects from eight families living within one mile from the compressor were surveyed. A physician also conducted interviews. Asthma, nosebleeds, headaches, and rashes were common among the 35. The researchers also provided five monitors to measure fine particulate matter in air near residences for the two months. Participants additionally used special canisters to capture air samples when the compressor emitted strong odors. In 2012 a blow out and a ten story fire and explosion at Springville Township when it was struck by lightening while gas was venting. Five compressor stations that push gas upstream to the Millennium Pipeline in Windsor Dunbar compression station from natural gas fields in Susquehanna County over the Pennsylvania border.Several accidents have occurred at the compression station in Windsor, a small town in Broome County. In January, 2014 a fuel line failed at Windsor's Dunbar compression station and gas sprayed over hot turbo-chargers and exhaust manifolds. The fire caused $3 million in damage. In Windsor compression station annually discharges up to 9.5 tons of benzene, 49 tons of volatile organic compounds (VOCs), 95 tons of nitrogen oxides and 99 tons of carbon dioxide. In New York, fracking wastewater from Marcellus Shale operations, such as in Pennsylvania, has been sent to at least five upstate New York landfills, even though none has a license to handle radioactive materials. Most shale formations contain naturally occurring radioactive material, or NORM. Although contamination levels vary widely from well to well, the Marcellus formation is suspected to be the most radioactive of all the nation’s shales. Officially, the NY Department of Environmental Conservation (DEC) allows Pennsylvania drilling waste at Hyland in Angelica, the Hakes Landfill in Painted Post, the Chemung Landfill near Elmira, Seneca Meadows Landfill in Waterloo and the Allied/BFI Waste Systems landfill in Niagara Falls. The agency argues that it is not authorized to regulate NORM unless it has been “processed and concentrated,” a phrase the DC Bureau says the agency interprets narrowly. A never-released study by the EPA and a confidential study by the drilling industry concluded that radioactivity in drilling waste cannot be fully diluted in rivers and other waterways, according to a February 2011 NY Times report. In December 2009, EPA scientists had advised New York that sewage treatment plants not accept drilling waste with radium levels 12 or more times as high as the drinking-water standard. In July 2013 a Syracuse laboratory pled guilty to one felony count of mail fraud in a case said to involve 3,300 falsified water tests. Some of the fracking wastewater was sent to Hyland Landfill in Angelica, about 80 miles south of Rochester. According to the environmental group Riverkeeper, fracking waste has been used to de-ice some of New York’s roads, as shown by state records obtained through a Freedom of Information Act request. Most of the state’s conventional drilling waste stays in New York and is sent to sewage-treatment plants such as Auburn, N.Y., near Syracuse, or is used to de-ice roads or tamp down dust on them, according to state regulators. The state also sends waste to privately owned treatment plants in Pennsylvania and Ohio. In written comments on New York’s proposed fracking rules, the federal Environmental Protection Agency has said that the state should ban the use of fracking brine on roads because pollutants could make their way into aquifers and waterways through infiltration and storm runoff. The agency also warned that there was probably not enough capacity at out-of-state treatment plants to handle polluted water from New York, while many in-state water treatment plants are not properly equipped to treat fracking wastewater. The EPA has said that specific disposal plans must be in place before any unconventional drilling permits for the state will be issued — and that finding sites will be up to the gas industry. The gas industry and ConEdison estimate 2.2% leakage in its Manhattan distribution systems, but a 2013 study by by Gas Safety, Inc. found an average cumulative leakage of over 5% in natural gas production and delivery. At leakage above 3.2% natural gas ceases to have a climate advantage over other fossil fuels, according to the Environmental Defense Fund. A paper published in October 2015 in Water Resources Research examined an area in New York above the Marcellus Shale formation. More than 30,000 wells burrow into the shale. The authors, Dr. James A. Montague and George F. Pinder, used a mathematical model to map the probability that new hydraulic fracturing would connect to a previously used oil and gas wells, create damage, and let methane seep. The probability was found to be 10% or more. The horizontal drilling process of forming fissures in the shale can create vulnerabilities and allow methane to seep. Climate Central reports that methane has about 35 times the power to warm the atmosphere as carbon dioxide. The EPA asserts that methane accounts for 10% of climate change in 2013. Hydraulic fracturing's production of hazardous wastewater is assumed to be partly due to chemicals introduced into freshwater injected into a well when it mixes with saltly brine naturally present in the shale rock. Dartmouth University researchers studied samples from three drill sites from the Marcellus Shale in Pennsylvania and New York to determine the possible reactions between the rock and water that release barium, and other toxic metals, during fracking. Dartmouth College's 2015 study, published in Applied Geochemistry, found barium in fracking wastewater finds chemically reacts between injected freshwater and the fractured shale. This could play a role in generating barium in hydraulic fracturing wastewater. Fracking takes place a mile below the surface. This is where chemical reactions occur between water and fractured rock at high temperature and pressure. Dartmouth team found that a large amount of barium in the shale is tied to clay minerals. This barium is readily released into the injected water as the water becomes more saline over time. In March 2012, a proposed $850 million natural gas pipeline through New York and New Jersey won the endorsement of the Federal Energy Regulatory Commission, which found that any environmental effects from the pipeline could be reduced to “less than significant” levels. The project was approved in May 2012, and will begin in Fall 2013. The $1.2 billion project is planned by Spectra Energy of Houston and will pipe 800 million barrels of natural gas a day. It consists of 15 miles of new pipeline that will run from Staten Island through Bayonne, N.J., and Jersey City to the West Village in Manhattan, where it would connect to Consolidated Edison’s distribution system beneath West Street. It would lie 200 feet under both industrial lands and highly populated areas, including homes, and cross more than 30 bodies of water, including the Hudson River. The project also involves replacing an additional five miles of existing pipeline between Staten Island and Linden, N.J., and installing associated equipment and facilities to be built in both states and Connecticut. Opponents have cited safety concerns, including the possibility of accidental explosions in the densely populated path of the pipeline, and the increase of unconventional drilling in the area that the project could bring. Propane hydraulic fracturing eliminates high volumes of chemicals and water. Instead it uses explosive propane injected under pressure into the ground producing brine, heavy metals, and naturally occurring radioactive. In March 2012, eCorp, GasFrac Energy Services, and the Tioga County Landowners Association reached an agreement to begin drilling the Marcellus Shale using liquid propane as a fracking agent. They believe that fracking with propane is not included under a New York state moratorium that prevents drillers from using high volume hydraulic fracturing. Chevron has used Gasfrac’s proprietary process of fracking with liquefied petroleum gas (LPG) in its $7.3B Piceance basins natural gas project. The deal had been accepted in concept by the leaders of the Landowners Association and had to be brought to the membership base of about 2,000 families. A majority of the landowners rejected the plan, and eCORP announced in May 2012 that it would try to work out another deal. In 2015 a landowners leased 53 acres to Tioga Energy to drill a well using propane gel for fracking. Whether propane fracking is covered by the state's fracking ban is under debate. The Press Sun Bulletin reported in August 2015 that Tiaoga Energy still needs drillers, financial backers, and a proven track record to complete applications for state permits. Chip Northrup, a retired Dallas oil investor living in Cooperstown, New York told the Press Sun Bulletin, that no drillers currently have the technical knowledge to do the kind of propane frack Tiaogo Energy is proposing. Chris Denton, a lawyer and major figure in the Gasfrac's 2012 propane frack deal, also represents landowners in the Tiago deal. 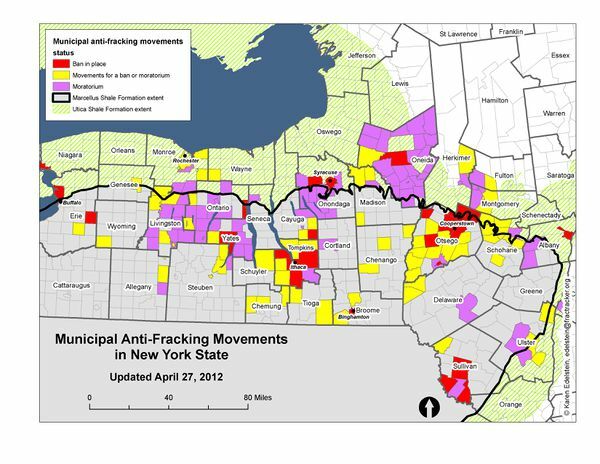 This map displays local anti-hydrofracturing movements in Southwestern New York. More than 100 communities in New York have passed moratoriums or bans on fracking, as of 2012. On June 30, 2014 New York's highest court ruled that towns in the state could ban fracking through zoning laws. According to the New York Times, "two towns — Dryden, in Tompkins County, and Middlefield, in Otsego County — amended their zoning laws in 2011 to prohibit fracking, on the basis that it would threaten the health, environment and character of the communities. Subsequently, an energy company that had acquired oil and gas leases in Dryden before the 2011 zoning amendment, and a dairy farm in Middlefield that had leased land to a gas drilling company, filed legal complaints, arguing that state oil and gas law pre-empted the town ordinances ... in a 5-to-2 decision, the State Court of Appeals affirmed a lower-court ruling rejecting that argument, and found that the towns did indeed have the authority to ban fracking through land use regulations." On April 12, 2012, Ulster County executive Mike Hein issued an executive order preventing the spreading of brine from hydraulic fracturing on any county-maintained roads. The ban does not apply to town or state roads in the county. On April 17, 2012, the Ulster County Legislature is slated to hold a hearing on a proposed law banning the use of fracking brine on any roads in the county. The wastewater brine from hydraulic fracturing wells (and conventional gas wells) has been used as a cheap replacement for road salt, allowing gas companies a way to dispose of frac fluid without trucking it long distances to wastewater treatment plants. Although the New York State Department of Environmental Conservation currently does not allow brine from hydraulic fracturing operations to be spread on roads in the state, the DEC does permit the spreading of brine from conventionally-drilled wells and other activities. A similar county proposed ban was defeated in Otsego County in February 2012, when it failed to pass the county's Natural Gas Advisory Committee, who said they weren't convinced there was a scientific justification for banning brine spreading. In early March 2013 Mark Ruffalo spearheaded the effort to create a plan for a renewable energy future for the state of New York. Along with filmmaker Josh Fox the two put together a team of researchers headed by Stanford University Professor Mark Z. Jacobson. Their report, titled "Examining the Feasibility of Converting New York State's All-Purpose Energy Infrastructure to One Using Wind, Water and Sunlight," was published in the journal Energy Policy. According to the study, if New York switched to wind, water and sunlight, deaths from air pollution–related deaths would decline by about 4,000 annually. Additionally the report states that the state would save about $33 billion – 3 percent of the state's gross domestic product – in related health costs every year. The report goes on to say that these savings alone would pay for the new power infrastructure needed within about 17 years, or about 10 years if annual electricity sales are accounted for. Houston based, Crestwood Equity Partners, project to store liquid propane in abandoned salt mines on the southwest shore of Seneca Lake has approved by the federal government now await state permits. On August 18, 2015, 19 people were charged with trespassing while protesting a methane storage facility under the shores of New York’s Seneca Lake. The company Crestwood Midstream was given the go-ahead for the facility in October of 2014 but has yet to break ground. S4220A-2011 - Would prohibit the use of hydraulic fracturing in the extraction of oil and gas. S6261-2011 - Suspends hydraulic fracturing for the extraction of natural gas or oil. S1230-2011 - Establishes a moratorium on the issuance of permits for the drilling of wells and prohibits drilling within two miles of the New York City water supply infrastructure. S1234-2011 - Relates to the regulation of the drilling of natural gas resources, including provisions to prohibit drilling within the NYC and Delaware River watersheds. S2697A-2011 - Amends the environmental conservation law to provide for greater regulation of oil and natural gas operations. S5592-2011 - Suspends hydraulic fracturing for the extraction of natural gas or oil until June 1, 2012. On March 6, 2013 the New York State Assembly passed legislation on that extended the state's moratorium on fracking in the state until May 2015 and requires further studies on the environmental impacts of the practice. In May 2013, Sen. Tom Libous blocked a similar bill in the Senate. Bloomberg reported that passage of the measure would harm the prospects of a real-estate company founded by Libous’s wife and run by his campaign donor Luciano Piccirilli, operator of Da Vinci II LLC, which has leases to underground natural gas in Albany. In February 2012, state Supreme Court Justice Phillip Rumsey held that the Ithaca suburb of Dryden's ban on gas drilling fell within the authority of local governments to regulate local land use, affirming the authority of towns to ban drilling - including fracking - within their borders. Anschutz Exploration Corporation, which owns more than 22,000 acres of leases in the town and has invested $5.1 million in drilling operations there, argued the ban violated a state law designed to create uniform regulations for oil and gas drilling. Rumsey disagreed, holding the law was not written to favor the industry, but to regulate it in such a way that "prevents waste ... and protects the rights of all persons," as "nowhere in the legislative history (of the state oil and gas law) is there any suggestion that the legislature intended - as argued by Anschutz - to encourage the maximum ultimate recovery of oil and gas ... or to preempt local zoning authority." In late July 2012 John Holko, president of Lenape Resources, a natural gas drilling company, in a letter threatened to sue if New York regulators did not extinguish fracking prohibitions in the town of Avon. In his letter to Department of Environmental Conservation Commissioner Joe Martens, Holko wrote that a moratorium prohibiting natural gas development in the Livingston County town of Avon forced his company to shut down its wells there. Holko said that Avon’s moratorium violated a 1981 law that says state rules supersede local ordinances in the regulation of gas development. On March 21, 2013 natural gas proposing and environmental advocates debated whether New York’s towns have the legal right to ban oil and gas development in a fight that could ultimately be decided by New York's highest court. It was reported: "A four-judge appellate panel heard arguments over the local bans in Dryden and Middlefield, two central New York towns among dozens in the state that have passed zoning laws prohibiting drilling. Opponents argue state rules supersede such local restrictions. The Dryden law is being challenged by drilling company Norse Energy and the Middlefield ban by a dairy farmer who said the town’s action prevents her from making money from gas wells that had been planned for her land." A Supplemental Generic Environmental Impact Statement (SGEIS) on the Oil, Gas and Solution Mining Regulatory Program Well Permit Issuance for Horizontal Drilling And High-Volume Hydraulic Fracturing to Develop the Marcellus Shale and Other Low-Permeability Gas Reservoirs in New York was issued for public comment on September 30, 2009 to address the range of potential impacts of shale gas development using horizontal drilling and high-volume hydraulic fracturing. The permit outlines safety measures, protection standards and mitigation strategies that operators would have to follow to obtain permits. DEC received more than 13,000 public comments on the SGEIS and issued a Revised Draft SGEIS in September 2011. In 2011, the New York State Department of Environmental Conservation (NYSDEC) proposed a ban of natural gas drilling within the New York City water supply watershed and a 4,000- foot wide zone around the watershed boundary. However, the Revised Draft Supplemental Generic Impact Statement (RDSGEIS) (September 7, 2011) did not contain similar protections for the water supply infrastructure located at the edge of or outside of the watershed boundary. The DEP determined that additional analysis focused on the water supply infrastructure was warranted, and hired Hager-Richter Geoscience, Inc. to provide a geophysical perspective, who concluded that the protections in the RDSGEIS are not adequate to protect the NYC West of Hudson water supply tunnels. E-mails between the federal EPA and NY state DEP show that the EPA offered extensive, specific criticisms of the DEC's draft review on fracking, which the DEP found excessive and out of line with the fracking activities allowed in other states. In another set of e-mails, the EPA gave a presentation on its intentions to sample the water of private water wells in areas of New York where drilling and hydrofracking are eventually expected to occur, planned for the end of 2011 (the tests never occurred). The EPA also recommended that state, city, and federal agencies should have joint oversight of drilling in the New York City watershed. In June 2012 the New York Times reported that, according to senior officials at the State Department of Environmental Conservation, Gov. Cuomo would likely limit drilling to the deepest areas of the Marcellus Shale rock formation — primarily Broome, Chemung, Chenango, Steuben and Tioga Counties. Drilling would be permitted only in towns that agree to it, and would be banned in Catskill Park, aquifers, and nationally designated historic districts. The strategy has not been made final and details could change, contingent on hydraulic fracturing receiving final approval from state regulators. The plan is part of a demonstration project in which the DEC would issue permits for a limited number of wells in certain areas and then monitor the fracking to see if the process could be done safely. Critics say drilling would primarily take place in economically distressed areas in need of the funds, raising issues of environmental justice. On June 28, 2012, the Environmental Working Group reported that New York regulators granted natural gas industry representatives exclusive access to shale gas drilling regulations as early as six weeks before they were made public, according to documents obtained by EWG through requests filed under the New York state Freedom of Information Law. In one instance, a representative of Chesapeake Energy used the exclusive access to try to weaken rules restricting discharges of radioactive wastewater, according to EWG. On July 10, 2012, seven New York lawmakers publicly accused Gov. Cuomo's administration of conspiring with industry to permit hydraulic fracturing with a minimum of regulatory oversight, and called for a new assessment on whether fracking is safe. In a report released in January 2013 a New York State health department report was released that stated fracking would not be a danger to public health in New York state so long as proper safeguards were put into place. Environmentalists feared the study could help lift a moratorium on the process. The Department of Environmental Conservation was granted a 90-day extension to its original deadline for completing a draft of fracking regulations in order for its environmental impact study to be reviewed by the state health commissioner and outside health experts. The January 2014 Common Cause report "Deep Drilling, Deep Pockets in New York State," found pro-fracking interests contributed a total of $15.4 million from 2007 to July 2013, with nearly $48.9 million of that lobbying in New York State. The state’s proposal to allow for drilling at 500 feet from aquifers that supply major municipal water systems “is one-size-fits-all and may provide only partial protection to these aquifers.” The USGS said that, in some cases, it might be necessary to prohibit drilling within five square miles of aquifers to avoid polluting them. Pressurized fracturing fluids could migrate through underground faults and impact an underground aqueduct that carries drinking water to New York City, making it "an issue of concern” that deserves more study. A map displayed in the state’s draft plan “grossly under-represents the number and extent of [natural] faults in the Appalachian Basin of New York” where shale gas drilling would occur. The USGS argues there are many underground faults that could channel pollution from drilling into underground aquifers. “Only scattered and incomplete information is available” on underground freshwater sources that could be polluted by shale gas drilling. The USGS suggested the state plan should require drilling companies to maintain detailed logs that would identify and protect these aquifers. The 2012 Environmental Working Group and Physicians, Scientists and Engineers for Healthy Energy report, Serious Flaws Plague NY Drilling Plan, challenges state officials' claims "that they can prevent pollution by limiting drilling to areas in the Marcellus Shale near the Pennsylvania border where the shale is at least 2,000 feet deep and there is at least 1,000 feet of separation between the top of the shale and water supplies." The report states that there is no empirical scientific data on drilling and fracking risks and no plan for disposing of the wastewater, among other risks. ↑ "Cuomo to Ban Fracking in New York State, Citing Health Risks" Jesse McKinley, The New York Times, December 17, 2014. ↑ Danny Hakim, "Cuomo Plan Would Limit Gas Drilling to a Few Counties in New York," New York Times, June 13, 2012. ↑ Alyssa Figueroa, "Revealed: NY Governor Plans to Experiment with Fracking in Economically Struggling Areas," Alternet, June 16, 2012. ↑ "Fracking health impact studies taking hold, with challenges" Associated Press, April 2, 2012. ↑ "Shift by Cuomo on Gas Drilling Prompts Both Anger and Praise," NY Times, September 30, 2012. ↑ Freeman Klopott, "New York Assembly Approves Two-Year Moratorium on Fracking," Bloomberg, Mar 6, 2013. ↑ "New York state officially bans fracking" Glenn Coin, Syracuse.com, June 29, 2015. ↑ Susan Lerner, Chris Keeley, and Deanna Bitetti, "Expenditures of the Natural Gas Industry in New York to Influence Public Policy: Parts 1 and 2," Common Cause, 2011. ↑ "Fracking ban forcing some New York towns to consider redrawing state lines" The Guardian, February 28, 2015. ↑ "The Promise of Fracking," Tom Wilber, Press Sun Bulletin, November 22, 2015. ↑ Tom Grace, "Officials positive following gas-well tour," Oneonta Daily Star, 7 October 2009. ↑ Susan Lerner, Chris Keeley, and Deanna Bitetti, "Expenditures of the Natural Gas Industry in New York to Influence Public Policy: Parts 1 and 2," Common Cause, 2010 and 2011. ↑ "NY Natural Gas Reserves," EIA, August 1, 2013. ↑ "FRACKED GAS HIGHWAYS: Pipelines feed demand, rattle neighbors" Tom Wilber, Press & Sun Bulletin, February 5, 2016. ↑ Allison Dunne, "Riverkeeper Raises Concern Over Fracking Waste As De-Icer For NY Roads," WAMC, Dec 10, 2013. ↑ Mireya Navarro, "Wastewater Becomes Issue in Debate on Gas Drilling," New York Times, May 3, 2012. ↑ "Manhattan Natural Gas Pipeline Emissions," DCS, 2013. ↑ "Potential of hydraulically induced fractures to communicate with existing wellbores," James A. Montague and George F. Pinder, Water Resources Research, Retrieved October 2015. ↑ "Study Targets Methane Leaks Between Underground Wells," Climate Central, Climate Central, October 21, 2015. ↑ "Overview of Greenhouse Gases," EPA.gov, Retrieved November 13, 2015. ↑ "Fracking plays active role in generating toxic metal wastewater, study finds," Science Daily, December 15, 2015. ↑ Tom Wilber, "Propane fracking faces long odds," Press Sun Bulletin, August 7, 2015. ↑ "Propane fracking deal reached in NY; Plan would open 130,000 acres in Tioga County for drilling," Ithaca Journal, March 29, 2012. ↑ "Tioga County, NY Lease Deal with eCORP Falls Apart," Marcellus Drilling News, May 2, 2012. ↑ "New York Towns Can Prohibit Fracking, State’s Top Court Rules" Kate Taylor and Thomas Kaplan, June 30, 2014. ↑ Lissa Harris, "Ulster County executive bans spread of frac fluid on county roads," Watershed Post, April 12, 2012. ↑ "Examining the Feasibility of Converting New York State's All-Purpose Energy Infrastructure to One Using Wind, Water and Sunlight" Mark Z. Jacobson, Anthony Ingraffea, et al. ↑ "19 Arrested, Including Grandparents, in Seneca Lake Fracking-Gas Protest" Earth First! Newswire, August 20, 2015. ↑ "New York State Assembly votes to block fracking until 2015" Reuters, March 6, 2013. ↑ Freeman Klopott, "N.Y. Senate Fracking Backer Tied to Firm With Gas Lease," Bloomberg, May 9, 2013. ↑ Dan Wiessner, "New York Fracking Ban: Judge Rules Towns Can Prohibit Drilling ," Reuters, Feb. 21, 2012. ↑ "Driller to NY: Stop the local fracking bans or we'll sue" Associated Press, July 31, 2012. ↑ "Bans on fracking argued before N.Y. state appeals court" Mary Esch, Globe and Mail, March 21, 2013. ↑ "Regulations," GroundWork, accessed April 24, 2012. ↑ Hager-Richter Geoscience, Inc., "Technical Memorandum: Geophysical Evaluation of Infrastructure Risks of Natural Gas Production On New York City West of Hudson (WOH) Water Supply Infrastructure," December 21, 2011. ↑ Jon Campbell, "DEC, EPA e-mails provide clues to future of drilling in N.Y.," Press Connects, Jun. 8, 2012. ↑ "Drillers Got Inside Track on N.Y. Fracking Rules," EWG, June 28, 2012. ↑ Colin Sullivan, "N.Y. officials accuse Cuomo admin of industry 'collusion,'" E&E reporter, July 11, 2012. ↑ "Fracking can be done safely in New York state: dept report" Reuters, January 3, 2012. ↑ "Cuomo administration edited and delayed key fracking study" Scott Waldeman, Capital New York, October 6, 2014. Tom Wilber, "Fracking in NY -- Step on the gas or slam on the brakes? Health, environmental officials far apart on impacts," Shale Gas Review, July 9, 2012. Ronald E. Bishop, Ph.D., CHO, "Chemical and Biological Risk Assessment for Natural Gas Extraction in New York," State University of New York, March 28, 2011. No Fracking Way Blog "No Fracking Way"
This page was last edited on 26 February 2016, at 08:43.